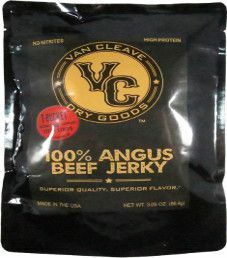 The next review on Van Cleave Dry Goods (aka VC Dry Goods) will be on a 3.05 ounce/86.4 gram bag of their t-bucket flavored beef jerky. This flavor is described as having a “classic teriyaki” foundation. Some things were removed, and added are “go fast parts and spicy mojo”. This bag was graciously submitted for review by the owner and founder, Adam Van Cleave. 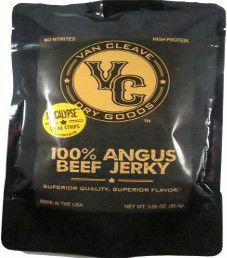 The next review on Van Cleave Dry Goods (aka VC Dry Goods) will be on a 3.05 ounce/86.4 gram bag of their apocalypse flavored beef jerky. This hot based flavor was kindly submitted for review by the owner, Adam Van Cleave. 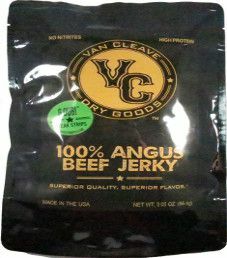 The next review on Van Cleave Dry Goods (aka VC Dry Goods) will be on a 3.05 ounce/86.4 gram bag of their Type-X flavored beef jerky. 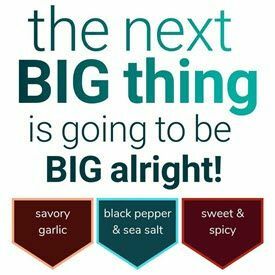 The Type-X flavor is described to have generous amounts of fresh ginger and garlic, along with spicy cayenne pepper. This flavor was graciously submitted for review by the owner, Adam Van Cleave. 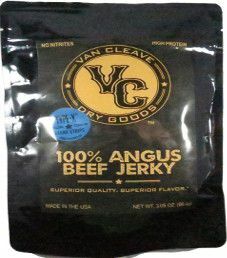 The first review for Van Cleave Dry Goods (aka VC Dry Goods) will be on a 3.05 ounce/86.4 gram bag of their G Dub! flavored beef jerky. This original based flavor was kindly submitted for review by Adam Van Cleave.